Heat oven to 350°F. Spray 8-inch square (2-quart) glass baking dish with cooking spray. Heat 8-inch nonstick skillet over medium-high heat. Add chicken; cook 2 to 3 minutes, stirring frequently, until lightly browned. Stir in onion, salt, oregano and pepper. Cook 3 to 5 minutes, stirring frequently, until chicken is no longer pink in center. Cool 5 minutes. Meanwhile, spread 1/4 cup of the enchilada sauce in baking dish. Stir 1/2 cup of the cheese, the sour cream and chiles into chicken mixture. Spoon mixture evenly down center of each tortilla; roll up and place seam side down over sauce in dish. Spoon remaining 1/4 cup enchilada sauce over tortillas. Cover with foil. Bake 30 to 40 minutes or until thoroughly heated. Uncover; sprinkle remaining 1/2 cup cheese over top. Bake uncovered 4 to 5 minutes longer or until cheese is melted. Sprinkle individual servings with lettuce and tomato. 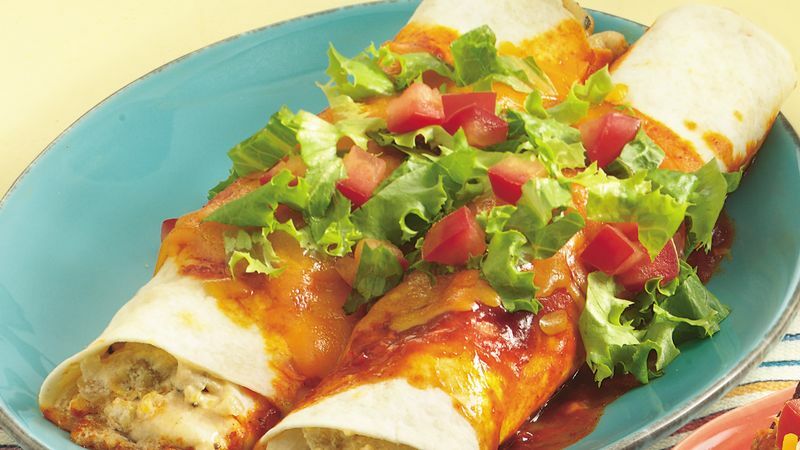 Although enchiladas are usually made with corn tortillas, this recipe calls for flour tortillas. Not only are they softer and easier to roll, but we like their flavor!